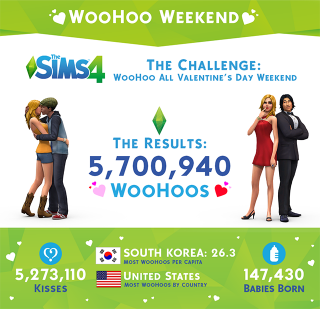 Your Sims WooHoo’d Over 5 Million Times Valentine’s Day Weekend! Turns out, your Sims really like to WooHoo! Last week we posed a challenge to the community: if you could reach a combined 4 million WooHoos in The Sims 4 over Valentine’s Day weekend, all owners of The Sims 4* would be given a new gnome in a patch in March. And if you reached a mind-blowing 5 million WooHoos, there’d be two new hairstyles included as well. We’ve crunched the numbers, run the data, and found exactly how much WooHooing was done over the weekend. Wow, that’s a lot of lovin’! And a lot of babies. Great work, Simmers! We hope you enjoyed the challenge, and we’re looking forward to giving everyone a new gnome (and two new hairstyles) in March. *When a new base game patch is available, you will be prompted to download the next time you log in. Just click “yes” and any new content will download with the patch.